← How do you approach dilemmas in your class/school? I love your comment on the 1-1 conversation being your ultimate strength in feedback. I imagine it is one of the things that makes you an amazing teacher: the ability to connect with your students and make them feel (and believe) that their learning matters. Thank you for the kind words, @REichholtz! Looking forward to catching up – See you Friday! Good insights – I think you’ve nailed it that student success has to be at the forefront of assessment! It’s great that you’ve had the chance to present your dilemma and then moderate a protocol with Adam’s. As we launch into a revamping of our assessment practices, I think collegial crowd sourcing is an important part of all this. We are pretty lucky to have a solid PLC at the school where we all learning and growing together. I love how you highlight the WHY – that learning happens in reflection and we’ve all experienced the power of reflection with professional and personal growth so why would be deprive our students of the same gift?! Thanks for an insightful blog and I look forward to keep pushing assessment forward with student learning at the forefront. Thank you @DDoucet! It’s all about the Why – Thank you for all your feedback this year. You are a wealth of information and you give critical feedback when I need it the most. 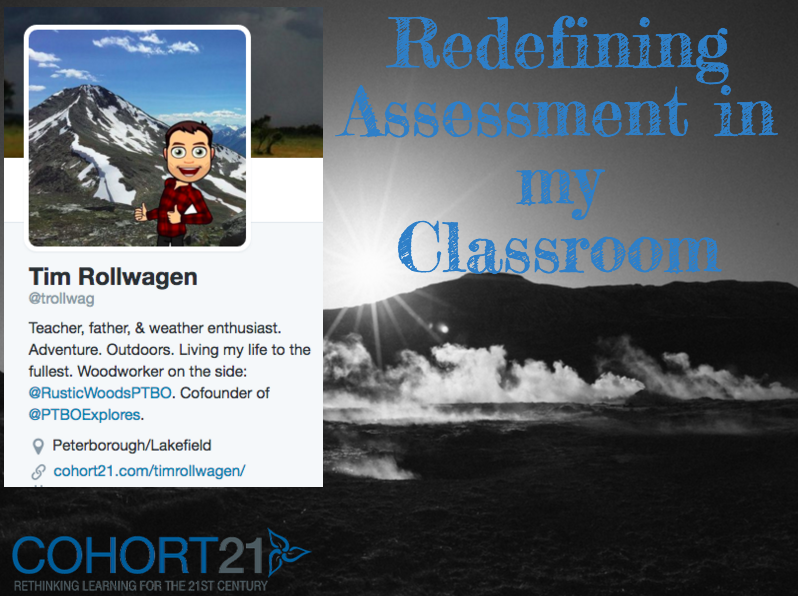 I look forward to more great conversations around assessment! Great reflection @trollwagen! One thing you said that really resonated with me was this: “I never want [students] to feel that a rubric or grade is the end game”. So often I think we forget that the purpose of assessment is really learning, and that feedback and rubrics are one way to communicate what has been learned. Why are we sometimes resistant to allowing students to have another chance to show us that they’ve mastered a concept, even if it’s after the “final assessment”? Exactly, @jweening! Thank you for your comment, Jen! @Gnichols really made me think when I posted my first Action Plan and I have been discussing this with a colleague who is playing with Differentiated Assessment (Particularly within a test). It’s all about the learning – assessments are just another tool to see what students can really do! See you Friday! Tim, to borrow a phrase from @ckirsh “I love your brain!” You’re doing some great work in a deliberate way, for a designed purpose. 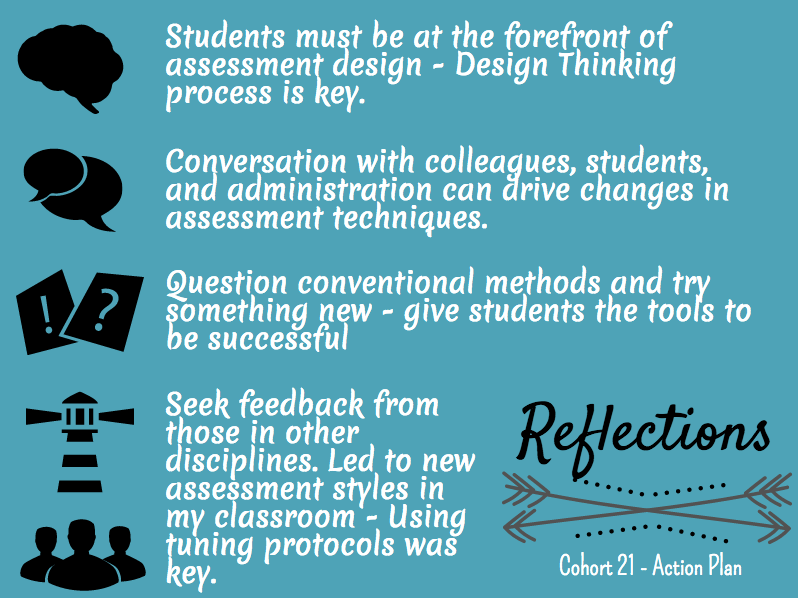 I would love to see what you have to say about @cschindler ‘s action plan on the use of assessment as learning. The work that you and our colleagues are doing right now with assessment is exciting! I am so appreciative that you “put yourself out there” by talking about a challenge in class and asking colleagues to help you. That was courageous and the result could not have been better. Thank you for your incredible dedication to Cohort! Enjoy the “trip” this weekend. Thank you, Struan. Some of the best feedback I have received about assessment is from people right here at LCS and from the Cohort 21 PLC. Every year has a new transformative year of learning. I appreciate the opportunity to be a part of Cohort 21. Love this community! I think it will be hard to avoid enjoying the ‘Trip’ this weekend!